"Taken from a poem by Charles Bukowski called 'The harder they try', 'if there is light it will find you' might sound a bit fatalistic and well, in some way it is, but it also offers hope. in this regard that line also works in contrast to the lyrics on this record: a lot of them might seem a little bit negative and depressing and that´s just what they are. i do believe that everyone tends to get depressed from time to time and i´m glad i have this outlet to get a lot of that stuff of my chest, but yeah, there is always a light at the end of the tunnel, even if it´s just the train steaming ahead of you... oh but don´t you worry, because tomorrow we will run faster, making for a great "Stand By Me"-esque escape. ps. : as always, the explanations offered are just my personal interpretations, feel free to read into the lyrics what makes sense for yourself. make your own noise. " 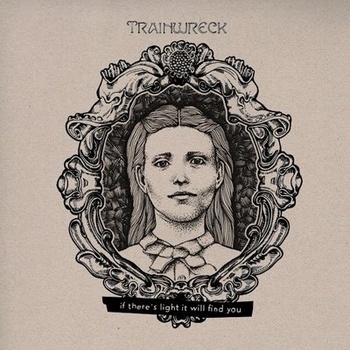 With an excellent mix of upbeat chaos that seamlessly transitions into a some very large breakdowns, Trainwreck is doing something here that I feel has taken on it's own voice and comes across in a refreshing and unique way. I can make some comparisons to bands with an epic feel, like Funeral Diner or Envy, mashed up with some heavier hitters, like Zann or Buried Inside. Their upbeat tendency keeps them from being pinned to any one style though, and this is where the band really stands on it's own feet. I can't recommend this enough.